Do You Remember... "Tales of Wells Fargo"
The same can be said of the ruggedly handsome, southpaw gunhand Dale Robertson who debuted NBC’s “Tales of Wells Fargo” on Monday nights from 8:30-9 (ET) on March 18, 1957, and ramrodded the series to the #3 position in the Nielsen ratings during the ‘57-‘58 season. As Wells Fargo agent Jim Hardie, Robertson was a private-eye on horseback sent each week to investigate trouble along the stage route. Many of the episodes were in the capable directorial reins of Earl Bellamy with director of photography being Republic alumni Bud Thackery. Dayle LeMoine Robertson, born in Harrah, OK, in 1923, grew up around horses. Determined to be an actor, he eventually landed a small role as Jesse James in Randolph Scott’s “Fighting Man of the Plains” (‘49), produced by Nat Holt, and signed a seven year contract with 20th Century Fox during which time he starred in “Return of the Texan”, “Outcasts of Poker Flats”, “O’Henry’s Full House”, “Silver Whip”, “City of Bad Men”, “Gambler From Natchez” and others. 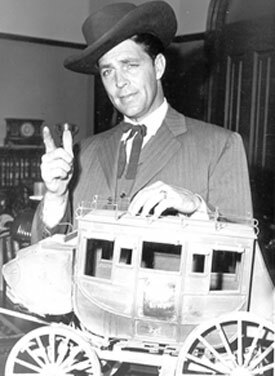 The pilot aired as “A Tale of Wells Fargo”, an episode of “Schlitz Playhouse of Stars” on Dec. 14, 1956. The series made its debut the following March without fanfare and quickly overtook CBS’ “Arthur Godfrey’s Talent Scouts” in the ratings. 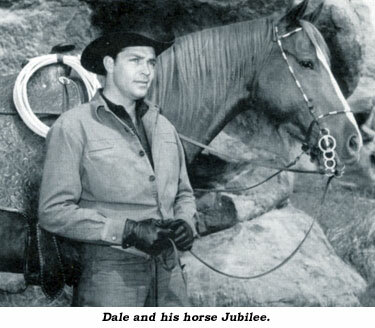 Robertson rode his own horse, Jubilee, throughout the run of the series in which he owned half interest. Usual sponsor was Pall Mall cigarettes. Besides Godfrey, for five seasons “Tales of Wells Fargo” out-gunned a lot of competition from ABC and CBS—“Bold Journey”, “Father Knows Best”, “Bringing Up Buddy” and “Bourbon Street Beat”. Producer Nat Holt was replaced in the 5th season by Earle Lyon (see his comments). With the 6th season (‘61-‘62) NBC expanded the series to an hour, changed the theme music, made it in color, added a whole “family” of secondary characters and moved “Wells Fargo” to Saturday night (7:30-8:30ET) where it was opposite the powerful “Perry Mason” on CBS. 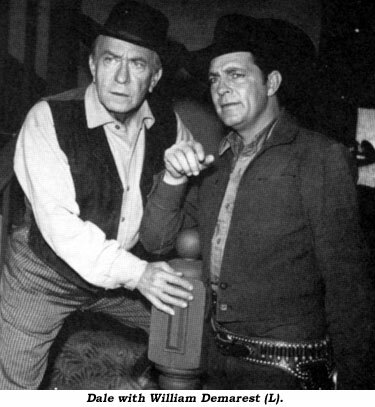 Cost, ratings and a new format were too much for the series and “Wells Fargo” was canceled after the June 2, 1962, episode. For the record, in the 6th season, Jim Hardie acquired a horse ranch near San Francisco and five new regulars: Jack Ging as his assistant Beau McCloud, William Demarest as ranch foreman Jeb Gaine, Virginia Christine as their neighbor, the widow Ovie, with Mary Jane Saunders and Lory Patrick as Ovie’s daughters Mary Gee and Tina. Jack Ging (born 1931 in Alva, Oklahoma) worked into the ‘90s and is now semi-retired. William Demarest (born 1892) entered films in 1926. After “Wells Fargo” he became famous as Uncle Charley on “My Three Sons”. He died in 1983. Mary Jane Saunders (born 1943) left show business in the mid ‘60s. Lory Patrick (born 1933 in W. Virginia) left the business in ‘67 and married actor Dean Jones in ‘73. She wrote the best selling book HEARING GOD. Virginia Christine (born 1920) started in films in ‘43 but is best remembered as Mrs. Olsen, TV spokeswoman for Folger’s Coffee. 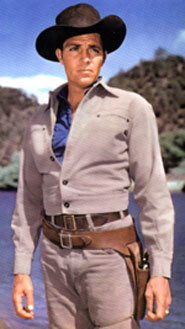 Dale Robertson lived for years with his wife Susan on their ranch in Yukon, OK, and only recently relocated to San Diego to be near relatives. Jack Ging, Beau McCloud in the 6th season of “Tales of Wells Fargo”, was raised on a farm in Oklahoma and learned to ride when he was a kid. Attending the University of Oklahoma on a football scholarship, he went on to play in the winning Orange Bowl against Maryland. After playing pro ball in the Canadian League and following duty with the Marines in Quantico, VA, Jack studied at Sandy Meisner’s Playhouse in New York and came to Hollywood in 1957 with his first role coming on a “Rough Riders” episode. Ging went on to work on hundreds of TV episodes as well as films like “Mosby’s Marauders”, “Play Misty For Me”, “High Plains Drifter”, “Where the Red Fern Grows”, TV’s “Winds of War” and dozens more. He also became quite successful in real estate. After modeling in Detroit and three years of work in New York, Lory Patrick came to Hollywood in 1960 and assumed the series regular role of Tina during the last season of “Tales of Wells Fargo”. Producer Earle Lyon had already written/acted in/produced such westerns as “Silver Star”, “Two Gun Lady”, “Stagecoach to Fury”, “Quiet Gun” and “Rawhide Trail”, when he came to “Wells Fargo”.